Chronic sinusitis, an illness that can feel as symptomatically miserable as congestive heart failure or rheumatoid arthritis, is often misdiagnosed or underdiagnosed. But distinctive clues can lead internists to deliver the right treatment. Closer relationships between primary care physicians and hospitalists and resulting improvements in patient care are achievable with relatively little effort. How physicians express cancer risks to patients determines how they might use that knowledge to make decisions about genetics, family history and potential future screens and tests. It has been a longstanding assumption in medicine that calcium, to paraphrase the milk commercial, does a body good. 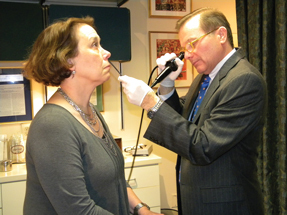 Chronic sinusitis can make a patient's life miserable, but it's often a difficult diagnosis to parse. Readers respond about medical marijuana, mindful medicine, pharmaceutical reps, and more. The patient-centered medical home might be health care next transformational innovation, one that will allow primary care to survive and thrive. It is often said that people don't see the forest for the trees, obsessing on the details instead of the big picture. An internal medicine practice followed evidence-based diabetes care guidelines and achieve honors from the National Committee on Quality Assurance, despite not yet having an electronic medical record. A lot of thinking and a dedicated team went into how the group's paperwork was able to accomplish the same goals. Internists can use new procedure codes to be paid for the increasingly common service of evaluation and managing a patient after their admission to observation status in a hospital. Selecting an EHR system for your practice involves sorting through vendors touting the certification of their products. A 74-year-old man is evaluated for a five-year history of gradually progressive dyspnea and dry cough without wheezing or hemoptysis. For the past 2 years he has had pain and occasional swelling in both knees. Physical examination shows no digital clubbing or cyanosis. What is the most likely diagnosis?.